Yogi Berra Romito Figurine! Limited to a World-Wide Edition of Only 500, This Figurine Features New York Yankee Great Yogi Bera! The signed version is already sold out! Don't wait long for this one! This is one of our own. Licensed by Major League Baseball since 1995, Romito, Inc. has produced some of the most limited and attractive baseball figurines ever made. This Romito figurine portrays the great Yogi Berra, one of the greatest Yankees ever. 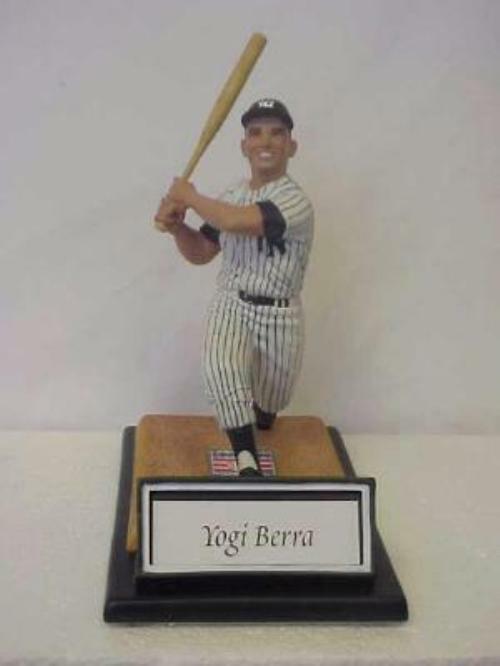 Limited to a World-Wide Edition Size of only 500 made, this figurine features Berra at the end of his swing. This figurine has the usual first class Romito features such as green felt and gold medallion on the bottom side of the base, tremendous quality in the base and a first class certificate summarizing Yogi's career. In the frame, featured prominently is Berra's name. The figurine is part of our Yankee and Hall of Fame Series. Own it today! Check out our other auctions for Romito figurines! Here's your chance to own our figurine below the wholesale price of $60! Don't delay before we raise our price back up to the SRP price of $120! Orders will ship priority mail unless package is over 4 pounds or 36 inches. If larger, it will ship parcel post. We accept VISA, MC, AMEX, and DISCOVER. We accept PayPal as well. Please call us at (703)728-8881 with any questions. Shipping and handling is a fixed fee of $10.00 for US shipping only. Please note that shipping and handling includes the costs of the box, packing peanuts/materials, labor. We charge a FLAT fee for shipping. We ship US Priority Mail and US Parcel Mail depending on the size of the box. International shipping is determined on an individual country/order basis. Orders may take up to 3 to 5 business days to ship once payment is received. Our return policy is that buyer's may return any item at their discretion for a full refund including shipping up to 30 days.